During the times of Sikhs Misls, the Sikhs were badly disunited. They successfully destroyed the aggressors but now they were fighting amongst themselves. All Sardaars (chieftains) were trying to destroy each other to extend their kingdoms. After the death of Sardar Gurbaksh Singh in a fight with one of the misls, his wife, Sardarni Sada Kaur took over the reins of her misl. The Singhpuria Misl had great enmity with Sardar Gurbaksh Singh. After his death, his wife Sardarni Sada Kaur like a warrior kept her position fortified thus resulting in the Singhpuriya Misl Sardar becoming her sworn enemy. He always looked for an opportunity to win over Sardarni Sada Kaur. His intelligence agents were always behind Sardarni Sada Kaur to watch her activities. On the other side Sardarni Sada Kaur was no less vigilant than the Singhpuriya Sardar. She always ensured that she was well-protected and always went out with no less than few hundred soldiers protecting her. The history stands witness to the fact that not only she was able to save her honour and position but she played a leading role in boosting the power of her son-in-law Raja Ranjit Singh. She fought along with Raja Ranjit Singh in all his big battles. This incident that we are going to narrate is long before she become a relative of Raja Ranjit Singh. Once Sardarni Sada Kaur decided to visit Siri Darbar Sahib – Amritsar Sahib. She took her guards and a small army and reached Siri Amritsar Sahib. At the same time as a coincidence the Singhpuriya Sardar too reached Siri Amritsar Sahib at the same time as Sardarni Sada Kaur. Both had similar aim of visiting Siri Darbar Sahib i.e. 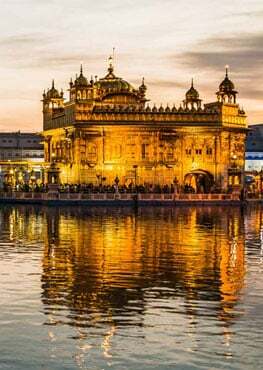 to do ishnaan in the sacred sarovar – Ramdas Sarovar and to pay obeisance at Siri Harmandir Sahib. The Singhpuria Sardar after doing ishnaan went inside Siri Darbar Sahib to matha tek and listen to kirtan. Right at that time, Sardarni Sada Kaur reached the Parkarma of Sarovar and went inside the ladies section to do ishnaan. While she was taking ishnaan (ablutions) her maids were standing outside and the Singhpuria agents realized quickly that Sardarni Sada Kaur was inside the ishnaan porch all alone. The agents whispered in ears about the presence of Sardarni jee and by then the maids standing outside too realized that the Singhpuriya sardaar was here and that his agents had found out that Sardarni Sada Kaur was all by herself and defenceless at Darbar Sahib. As the agents rushed to inform the Sardar about Sada Kaur being present at Darbar Sahib totally defenceless, the maids dashed inside the ladies area of sarovar to tell Sardarni jee about the possible danger from the Singhpuriya Sardaar. Then Sardarni told one of her maids to go outside Darbar Sahib and inform her soldiers that they should not be prepared for a possible fight outside Darbar Sahib. After such bold answer, she became oblivious of her surrounding and started doing ishnaan again. On the other hand, the intelligence agent went to inform the Sardar about Sardarni Sada Kaur being alone and how it was a great opportunity to capture or kill her. The Singhpuriya Sardar was listening to kirtan very keenly. The kirtanees were singing a very bairaagmai shabad that stated the futility of our efforts to collect worldly wealth. Sardaar’s mind had become purified as it was one with shabad. The soohiya (agent) unaware of the spiritual and mental state of the Sardar, went dashing in Darbar Sahib and even forgot to do matha tek. The only thing in his mind was to get reward for telling the whereabouts of Sardarni Sada Kaur. He did not care about keeping respect of the sangat present there, nor did he realize the message of the shabad being sung. He hurriedly went over to the Sardar and in his ear whispered, “Sardar jee, Rani Sada Kaur at this time is taking ishnaan in the ladies area of the sarovar. She is totally unprotected. This is a great opportunity to kill her or capture her alive”. Sardar’s mann (mind) at that time was totally engrossed in Gurbani and had become pure. He got upset at the action of the soohiya and how he had not cared about keeping respect of Guru and sangat. He thought if this soohiya was only a soohiya and not a Sikh. The soohiya in the meantime was standing by waiting for the Sardar to respond. The sardar keeping fear of Guru whisperingly said, “Go away from here. You are not fit to stand here in Siri Harmandir Sahib. You did not even care about Guru, Sangat and Siri Harmandir Sahib. You did not care that this was not the right time and place to talk about such lowly thing. You are not a Sikh of Guru. Get away from my eyes”. Saying this the Sardar came out and ordered one of his soldiers to arrest the soohiya. The sardar came back and started meditating on the shabad of Guru. After some time the Sardar got up and started walking out of Siri Harmandir Sahib. In the meantime, Sardarni Sada Kaur after finishing her ishnaan, started walking towards Siri Harmandir Sahib. She was standing by Darshani DeoRi and the Sardar came out. Both Sardarni and Sardar were engrossed in baani. They were sworn enemies of each other. When they saw each other, both stopped. The sardar made the first move. He had Degh (parshaad) in his hands and said fateh to Sardarni jee, “Bhain jee please accept parshaad of Guru Ramdas jee. 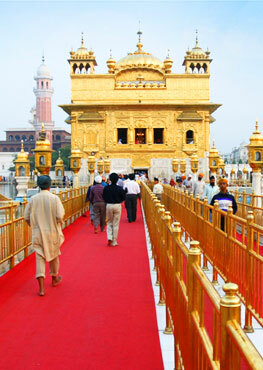 I had thought that when I come out of Darbar Sahib, I will wait for you to come and give you parshaad. It is my honour and good fortune that you came right at the time I came out of Darbar Sahib. Now please accept parshaad from me”. Sardarni jee was moved by the humility of the Sardar and said fateh back to him and responded, “It is my big fortune (Dhan bhaag) that I am receiving parshaad from that veer’s hands whose hands only handle sword. Well! My visit in the hazoor of Guru Ramdas jee has been successful”. Sardar got emotional and said, “After listening to the great gift of Guru Sahib to us – Gurbani – I can only derive that what we are doing is futile. Only his naam is true and rest is false. Listening to Gurbani brings peace to mind. How foolish are we who indulge in petty enmities and ignore the message of Guru”. “If you too are thinking along these lines, then Bhain jeeo, let us bury our enmities right now and perform an ardaas before Guru Ramdass jee. Let us make up for the past and from now on live like real brother and sister. Let us reconcile and finish off these problems and enmities created by maaiya”. After this they both sent a message to one of the greatest Granthi of Siri Darbar Sahib – Bhai Sahib Chanchal Singh jee to perform an ardaas for their unity. While they were waiting for Granthi jee to come, they both closed their eyes in Anand of Gurbani and felt immense love and thankfulness for Guru Sahib. From that day onwards, they stayed like real brother and sister for rest of their lives. Ones who were thirsty for each other’s blood developed so much love for each other that even real biological brother sister cannot do. Such is the shakti of Gurbani and Naam. It is my ardaas before Satguru to do such miracle on the Sikh panth at this time. We are totally disunited. We need a miracle to get united again. Guru Sahib jeeo, kirpa karo.